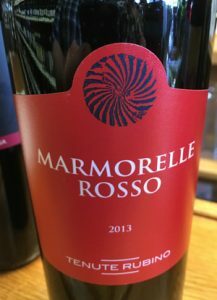 2013 Tenute Rubino, Negramaro “Marmorelle Rosso” Salento, Italy. From Primitive to Spumante, Tenute Rubino makes wonderfully crafted modern wines in the Salento region of southern Italy, and this juicy Negramaro is great example with depth of fruit, balance and textural harmony, showing dark fruits, spice and ripe satiny tannins. Tenute Rubino offers some of the best wine for the money, with traditional grapes and sharp packaging, Li Veli and Tenute Rubino are making Salento a very worthy for specialized wine tourism, reviving account varietals like Susumaniello as well as highlighting, in Tenute Rubino’s case, Brindisi terroir. The 2013 Negramaro Marmorelle Rosso IGT Salento with a touch of Black Malvasia to add a bit more flourish and aromatic complexity sees only a short spell in wood to give richness of detail while remaining fun, lively and pure, it displays lush plum, black cherry, raspberry and concord grape fruits with hints of cedar, pepper and mild lavender, lilac and sweet herb notes. This is a great party or house wine, super with outdoor cuisine, can even be served with a slight chill for BBQ’s in the summer months and full enough to stand up to robust foods, it’s a solid and pleasing red to quaff over the next year or so, simple, but worth your attention. Be sure to check out Tenute Rubino’s much more serious Punta Aquila Primitivo, it’s a wildly entertaining red that offers more intrigue and layers, very old vine Zin like in style, this is an impressive winery to look for.